Happy Holidays, creative friends! We’re excited to bust out our Christmas goods this week – we’ve been patiently waiting to decorate in all things red until Thanksgiving officially ended. 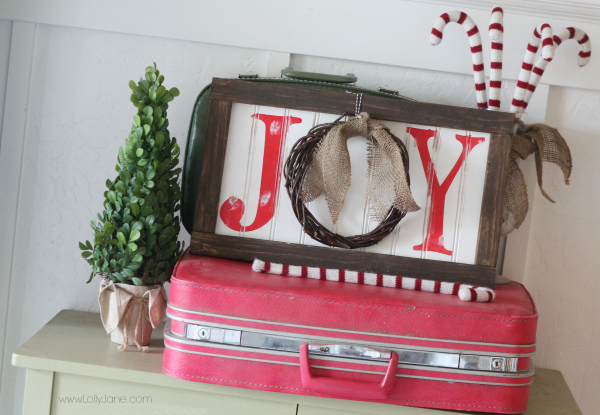 We’ve been sharing Christmas decor on our blog already, so be sure to check them out. 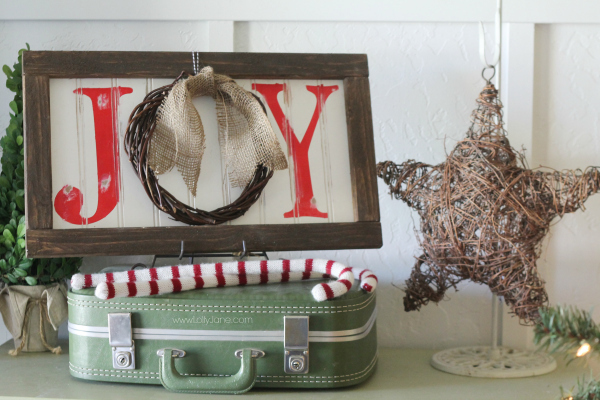 Today’s post is a fun do-it-yourself sign. 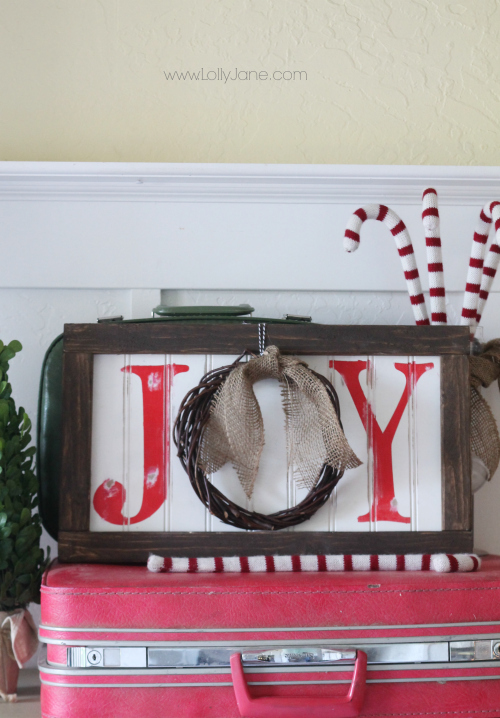 We love wood crafts and our saw, so this was a match made in heaven for us (; This easy JOY sign would make a fun neighbor gift, especially since it’s affordable– which is our favorite kind of craft! Cut bead board to size, mine is 20″ long x 11 1/2″ tall. Measure + cut trim to size, I used a Ryobi miter saw, 4 quick cuts! Paint trim brown, I used DecoArt’s “Raw Umber”. Don’t forget the edges of your bead board too! Screw bead board to trim from the back of the bead board using 1/2″ screws. Apply stencil (I used BellMT font/bold) and paint inside red. 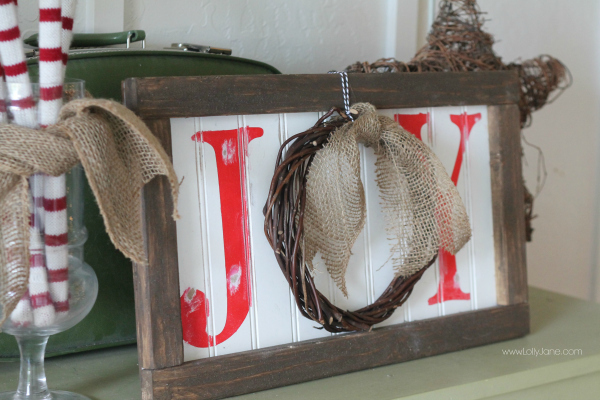 Use bakers twine to hang the wreath discreetly behind the frame, tack into place. Hang and display, and you’re done! This project was free for me since I had everything in my stash in my craft room! 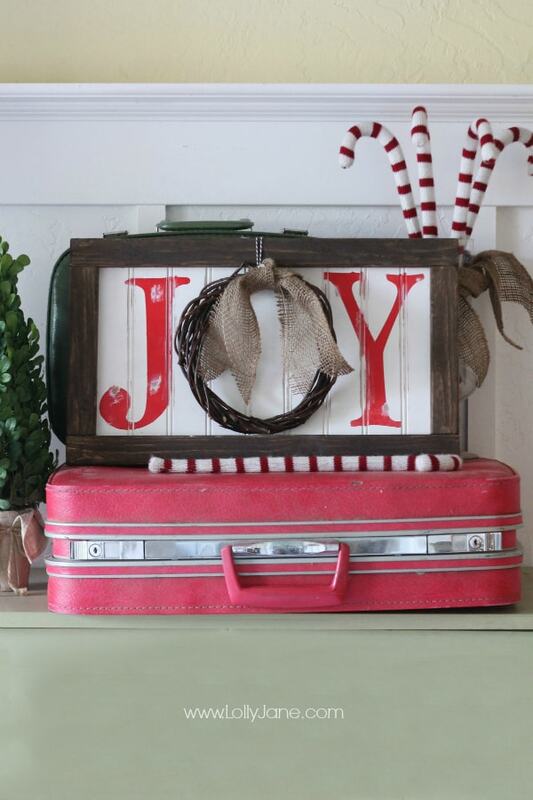 For more easy Christmas and decor ideas, be sure to catch up with us on FB, Pinterest, Twitter or Insta. Merry Christmas, everyone!